Find the most COMPATIBLE INTERESTING AWESOME INTRIGUING AMAZING people nearby. Private, free, & in groups of 3. Always meet friends of the same gender and in groups of 3. No room for awkward silences or unwanted advances. We respect your privacy. Your profile is never public. Only those you have already matched with can see you. Our algorithm considers over 150 factors when deciding who to connect. It also uses machine learning to improve over time. Meet shockingly compatible people in your area. Swipe through cards about your personality, values, lifestyle, interests and more. Complete different levels by answering short quizzes about yourself. We’ll build a comprehensive profile that tells us who you are and the type of people you will really connect with. You can also learn about your We3 personality type to understand your main strengths and potential vulnerabilities. Connect with the most compatible people around you. Our smart matching algorithm scours our user base and connects you to others by adding you to “Tribes”. Tribes are group chats of three people that were formed because they have a whole lot in common. We know you’re busy, so we only connect you with the people that you are most likely to become great friends with. Check out your shared traits, interests and goals. View the highlights of each Tribe you’re a part of. You can see your shared traits, mutual interests, and common goals. Find out what are the activities you all enjoy doing or discover the new things you all want to try. Start chatting and make a plan to hang out. 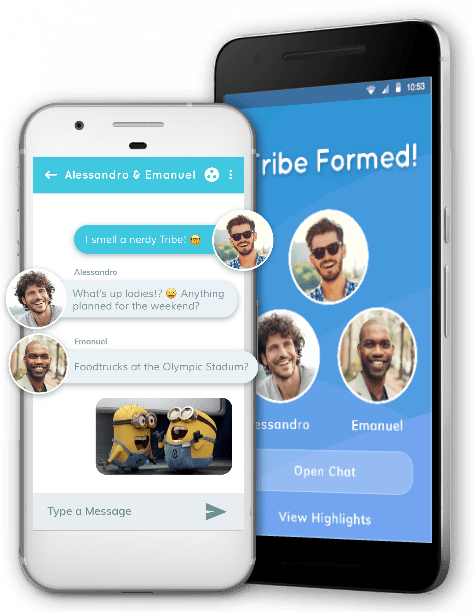 Chat as if you were already close friends. In a parallel universe, it’s likely you already are. Make sure to make plans to meet up. We3 was built to make friends in real life, not on your screen.